H265 is coming to the video world because it’s fantastic! And, it is believed to be able to encode a 27.8GB Bluray video down to 1.8GB with 5.5Mbps from 83Mbps without losing quality! The advent of this coding standard has made video sites even more powerful, enabling them to deliver higher-definition movies at the same network bandwidth, which also paves the way of 4K video streaming. 1 Why H.265 is better than H.264? Why H.265 is better than H.264? Compared with H.264 / AVC, H.265 / HEVC provides more different tools to reduce the bit rate. 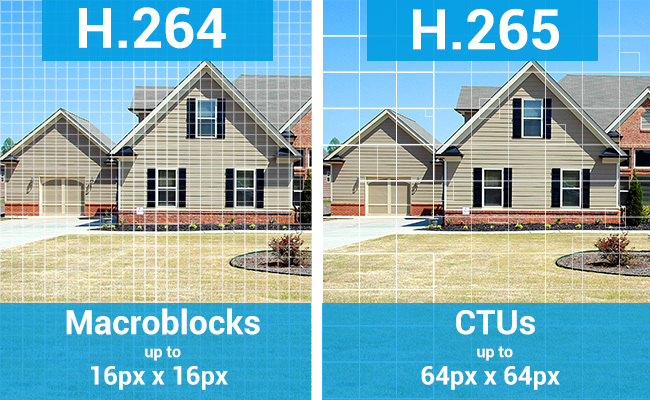 In terms of coding units, each macroblock (MB) in H.264 has a fixed size of 16 x 16 pixels, but in H.265, we can choose from the smallest 8×8 to the largest 64×64, which accordingly increases the coding efficiency. Meanwhile, H.265’s intra prediction mode supports 33 directions (H.264 only supports 8), providing better motion compensation processing and vector prediction. H.265, a video coding standard that follows H.264, was born to deliver higher quality video over limited bandwidth. H.265 is based on H.264, retains some of the original technology but improves the code stream, coding quality, delay and the relationship between the complexity of the algorithm related technologies. H.265 does better jobs in improving compression efficiency, improving robustness and error resilience, reducing real-time delay, reducing channel acquisition time and random access delay, and reducing complexity. I want to rip and reencode my Bluray DVD library to x265 (HEVC). However, I also want to use the higher efficiency of the video codec while keep audio the same. Reducing original Bluray h264 to 60% bitstream that should keep the quality the same but reduces the size would be perfect to me. I would like to have the option 1:1 (video, sound) convert to H265 highest quality. There are a great many of Bluray DVD ripping solutions that supports recoding to H.265 as well as H.264, but Leawo Bluray Ripper, which I’d like to recommend today, develops its own H.265 transcoder by optimizing the X265-default core architecture and overcomes the bottleneck of HEVC / H.265 coding and realizes real-time software coding of complex 1080P videos, making it one of the best Bluray DVD to H265 ripper on PC and macOS including the very latest macOS High Sierra, Mojave and Windows 10. Leawo Bluray Ripper now supports ripping and re-encoding Bluray and DVDs to H.265(HEVC) in MP4 and MKV. Also, with the support of latest Bluray and DVD copy protections, it handles all kinds of Bluray and DVD discs purchased all over the world. You can follow the below buttons to have a free trial of the H.265 ripper or follow the guide below to see how to rip and convert Bluray DVD to H.265 HEVC MP4 MKV. I have quite a lot of posts how to use Leawo Bluray Ripper or Leawo DVD Ripper to rip and convert Bluray as well as DVDs. But most of them are for MP4 H.264 as it is still the most compatible format for almost all players and devices like iPhone/iPad or Android flagship Galaxy S9(Plus). The guide below is on how to use H.265 Bluray DVD Ripper to output h.265 video format in MP4 or MKV. Follow the above download buttons to download and install H.265 Bluray and DVD ripping solution. Please note what you download will always be Leawo Prof. Media as the total solution. The Bluray Ripper and DVD Ripper is part of the function module. Firstly, click Bluray ripper or DVD Ripper or the Convert tap on top and add the Bluray or DVD via Add Blu-ray/DVD-Add from CD-ROM. Main Mode is recommended as always. But Custom Mode is for TV series and workout DVDs. MP4 Video MPEG4 is the default profile. Click it and click Change to change H264 to H265 or Edit to custom the resolution, bitrate etc. We are almost ready for Bluray DVD to H265 ripping! Click the big Convert button to start so! ← Unable to Rip the new Power Rangers Movie (2017) to MP4 MKV? There’s the Solution!